Storey Publishing, LLC, 9781603427111, 448pp. "Every once in a while there is a book that lives up to it’s hype. Only once in a blue moon are we lucky enough to get a book that surpasses all the stories that have led up to it. 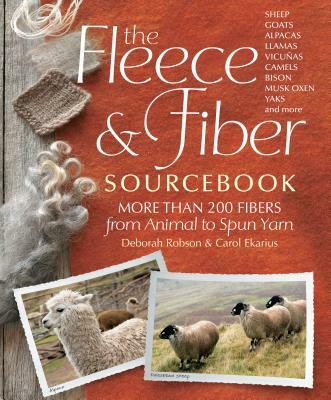 The Fleece and Fiber Sourcebook is a blue moon book. The spinning world has been buzzing about this book for years, and Deb Robson has been kind enough to share writing the process on her blog, but that still didn’t prepare me for the completeness of the book. Spinners (and knitters) this is the book you’ve been asking for: more photos and breeds than In Sheep’s Clothing and more sheepy and animal goodness than The Knitter's Book of Wool. A labor of sheepy love and a stellar book." This is an excellent resource for fiber artists curious about different types of animal fibers and how best to use them. Two experts, one a farmer and livestock guru, the other a fiber magazine editor, join brains to produce this resource for yarn crafters. Far from drab and dreary, Robson and Ekarius enliven the pictures and descriptions of about 200 breeds of sheep, inserting critical information and fun facts. Well written and researched, a reference for all ages. Not only is this a library essential for yarn users who take their wool, alpaca, llama, cashmere and yak seriously; it’s also an important text for those involved in the husbandry of our four-legged fiber friends. If we want to preserve our “heirloom” fibers, we need to know their names. A reference you'll return to again and again as you grow as a fiber artist. A comprehensive manual for the wool aficionado. Packed with photos and detailed fiber properties, it covers every breed of sheep you are likely to encounter and then some.